The Implementation phase is where the learning, training, processes, Products, and services are actually delivered to the learners. This total package is called a Learning Platform. 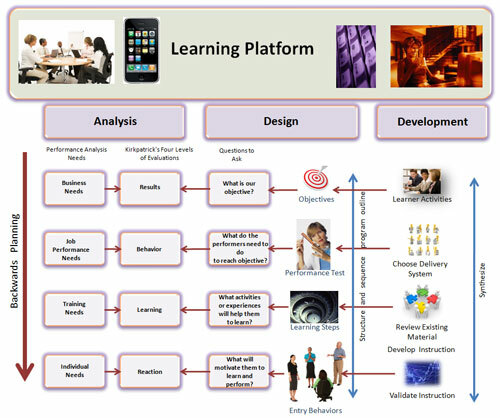 A learning platform is an integrated set of services that provide the learners with information (content); tools, such as social learning media; activities; and resources, that support and enhance their quest to learn new skills and knowledge and supports the learners' Personal Learning Environment (PLE). To some, this may sound like the easy part, but it can be the hardest part of the system. Good trainers can make a poorly designed program work well and a well designed program work great... bad trainers can make neither work. If the learning platform is delivered in a different manner, such as elearning or a Job Performance Aid, the platform must still be supported. Through their experience, training, and education, skilled instructors are able to transform an inanimate platform into a living experience for the learners. The learning platform may consist of only a small single piece of courseware, such as a 20 minute elearning course, a mobile performance support app, or a blending learning environment that consists of of several pieces of courseware, such as classroom, elearning, and performance support that takes several hours or days to complete. If the learning platform has no instructors assigned to it, such as a stand-alone elearning program, then other means should be provided to assist the learners when they need it, such as a support line, discussion group, Twitter contact (micro blog), etc. You might think of the Implementation or Delivery phase as just “starting the training;” however it actually starts with creating the Learning Management Plan (LMP) that outlines the steps and required resources to successfully implement the learning platform. It informs the learning/training team how to deliver the training according to plan and with maximum learner involvement. Non-trainer led learning platforms, such as a stand-alone elearning program, should also include a LMP. Markus, H., Ruvolo, A. (1990). Possible Selves: Personalized representations of goals. Goal Concepts in Psychology. Pervin, L. (ed), pp211-241. Hillsdale, NJ: Lawrence Erlbaum.